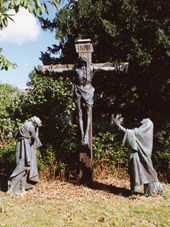 The bronze group was originally commissioned for the Chapel of the Society of the Sacred Mission at Kelham Priory, and was transferred to Willen Priory in Milton Keynes in 1973, where it was installed in the grounds. 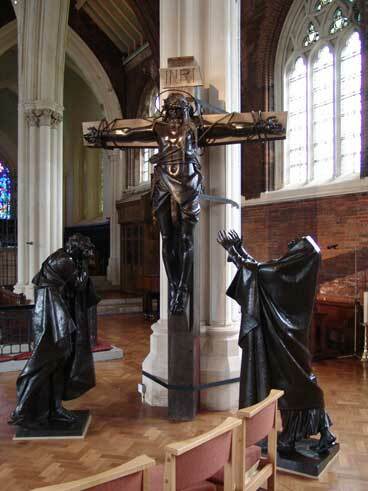 The sculpture group consists of three bronze figures - two standing figures of The Blessed Virgin Mary and St John, and the central bronze of Christ which is bolted in four places to a large cross made from Burmese teak, with bronze rope bindings. On first inspection, the overall surface condition of the bronzes was sound, although much of the original patination has been lost and had been replaced by a layer of green copper corrosion products, in the main consisting of copper sulphates and carbonates. There was also evidence of several old applications of a pigmented, lanolin-based wax, much of which had weathered away leaving some areas of sulphation encrustation, particularly on the undercut or deeply modelled areas of the sculptures. 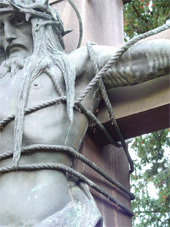 The only real structural damage was to the halo of Christ, which was fractured at the back. After removal to the studio the sculptures were first cleaned: the bird guano was removed with mall wooden spatulas and picks, traces of the lanolin wax were removed using high pressure steam with a little water soluble emulsifier, any remaining traces were then removed by a secondary clean with white spirit applied with paper towel and soft brushes. All bronze surfaces were then degreased with a petroleum based distillate. Following removal of the wax, the areas of more severe green corrosion and areas of sulphation crust were removed by hand using wooden picks and bronze brushes, and where necessary spot cleaned with alkaline swabs, dilute Rochelle Salts or hydrogen peroxide. Finally the sculptures were washed thoroughly with water to remove any residue. After cleaning, the bronzes were inspected for any corrosion damage, casting flaws etc. At this point a decision was made on the final visual appearance of the sculpture. Repairs to the fractured halo were then carried out by welding the halo into position, cleaning up the weld and repatinating to match the original chemical patination. The surface of the sculptures were then selectively repatinated to match the areas of existing original patina. This was carried out in the traditional manner. All areas of original patination were retained. The surface of the bronzes was waxed with four coats of Renaissance microcrystalline clear wax, the first two coats applied to the warmed surface of the bronze. Each coat was allowed to cool and then buffed by hand using soft brushes and cloths. The group was then temporarily installed in its new home, the church of St John the Divine in Lambeth, south London, while plans are made for a new, appropriate setting for the group within the church. While his career was short (it spanned just 16 years), Charles Sargeant Jagger (1885-1934) established himself as one of the leading war memorial sculptors in the years following 1918, and his contribution to the history of British sculpture should not be underestimated. After leaving the Royal College of Art in 1911, Jagger had little time before the outbreak of war to develop a personal style. However, on his return to Britain in 1918 the sculptor wasted little time in establishing his artistic identity: his sculptures of soldiers forming the foundation for his reputation. The combination of realism and primitivism is evident throughout Jagger's body of work, from the war memorials to his later creations that included religious works, portrait statues and decorative architectural schemes.